The City of Hoboken will be redesigning, renovating, and upgrading Madison Street Park, located at 3rd Street and Madison Street. 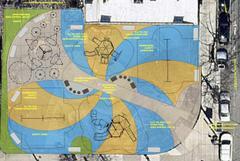 The purpose of the project is to upgrade old equipment and make better use of limited park space. Members of the community are invited to provide input on the project by completing an online survey available at www.hobokennj.gov/madisonparksurvey. A public meeting to gather additional public input will held on Tuesday, January 30, 2018 from 7pm to 9pm at the Multi Service Center, located at 124 Grand Street. A public notice will follow for a public hearing scheduled for February 15, 2018 from 7pm to 9pm at the Multi Service Center.